Enter our summertime blog hop giveaway Here! I love mixing and matching the Moxxie collections. Honestly? I usually don't mix and match papers across collections that often, but I seem to be doing it all the time lately with Moxxie's collections. Today I'm mixing Down on the Farm and Child's Play for my Playtime on the Farm layout. We go to my in-laws almost every Sunday for lunch. When the weather's nice, my boys head right outside to play. We love finding the kittens (there are always kittens in the spring, summer, and fall). My youngest nephew hasn't quite figured out how to gently love the kittens...but he's working on it (disclaimer: no kittens were hurt in the taking of these photos). I used a combination of stickers, journaling cards, and die cuts from both collections to tie the papers from both collections together. For the "Some Playtime!" tag, I covered up the word "pig" from the "Some Pig" label sticker from Down on the Farm with a "Playtime" die cut from Child's Play. Layering stickers and die cuts up is a great way to customize your titles. Do you like to mix and match collections? We'd love to see what you've done. Just post a picture on Moxxie's Facebook page! The 4th of July makes me think of hometown Americana and family Bar-B-Ques. Here is my family (my mother-in-law with my niece and nephew) being down-home American. I used MOXXIE Down on the Farm line. The title "Sweet Ride" makes me laugh. I just cut out one of the journal cards that could also fit nicely into a pocket page, but also works perfectly for accents. That green tractor paper might very well have been made for this photo, don't you think? I'm in love with the depth of brown color that I used for the background. I added a touch of texture with burlap and wood buttons to bring out the rust of the trailer. The bold pop of red is thick chipboard and adds a playful touch. So here is wishing you a down-home 4th of July filled with lots of warmth and fun. This is my first post as a Moxxie Muse and I am very excited about being able to be here. I used Down on the Farm collection. as I I saw this line I knew the perfect photo to use of my beautiful Granddaughter. I made the flower using Moove Over and Fields of Gold. And every girl needs a little bling so I added some on the center button. I also cut a few tractors out of the Sweet Ride paper and popped them up to give some dimension to the page. Down on the Farm is one of my favorite lines from this latest release. I love the vibrant colors and who doesn't have some photos that go with this line? 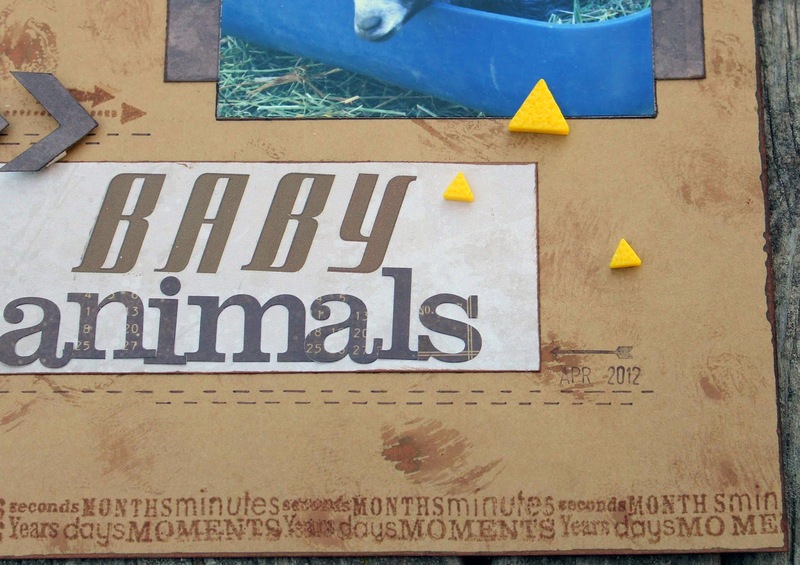 My most recent layout is about our trip to Baby animal days at a nearby ranch. Our kids had a blast at this fun event! I wanted it to have a real farm feel so I started with a brown background and rubbed it with some mist ink that I put on a paper towel. Then I used the awesome papers from the line to accent my background and build blocks to show off my photos, title and journaling. I also cut this Farm Fresh accent out of the journaling cards sheet. It was perfect for this baby animal moment! This close up of the main photo shows you the stitching, stamping and fun embellishing. Part of my title is using the awesome brown Moxxie rub-ons. I used the Journal card sheet and cut out this wonderful roped journaling spot to really draw the eye to my journaling. Hi Moxxie Fans! 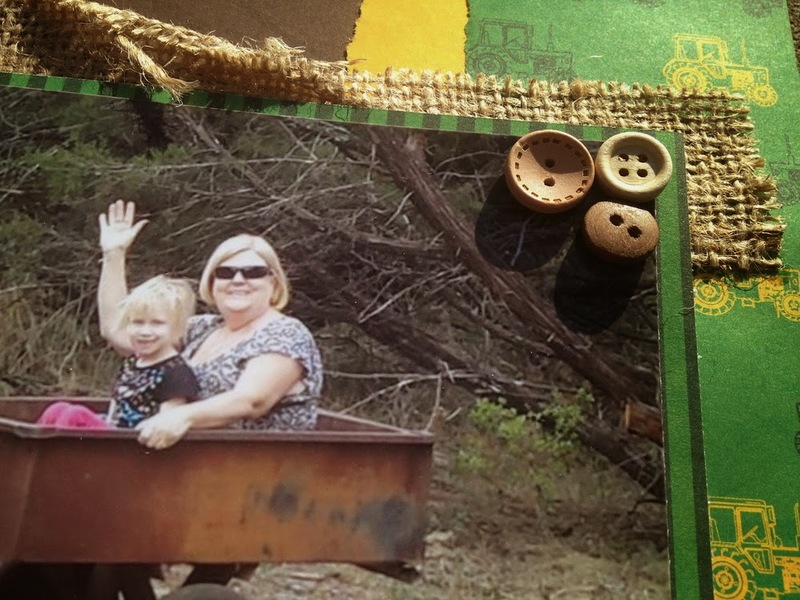 Susie hosting the blog using the new Down on the Farm line to create a Project Life style pocket page. These pictures are actually from one of our visits to the local pumpkin patch in the fall. There are lots of farm animals and equipment around, so this collection is perfect! First thing I did was to create a title block by layering some stickers over the coordinating green striped papers. The edges of the photos were distressed and inks. My oldest son, Brian was working at the pumpkin patch and was manning the top of one of the slides. I used the coordinating check paper to create backgrounds for these 2 photos...can you believe how well my daughter's shirt matches?!? I customized this title card with stickers and a small photo - close up of my son on the tractor fits perfectly into the next pocket. This card has such a strong, fabulous graphic - it is my favorite! I journaled a little on this photo before I printed it out, then distressed and inked the edges. 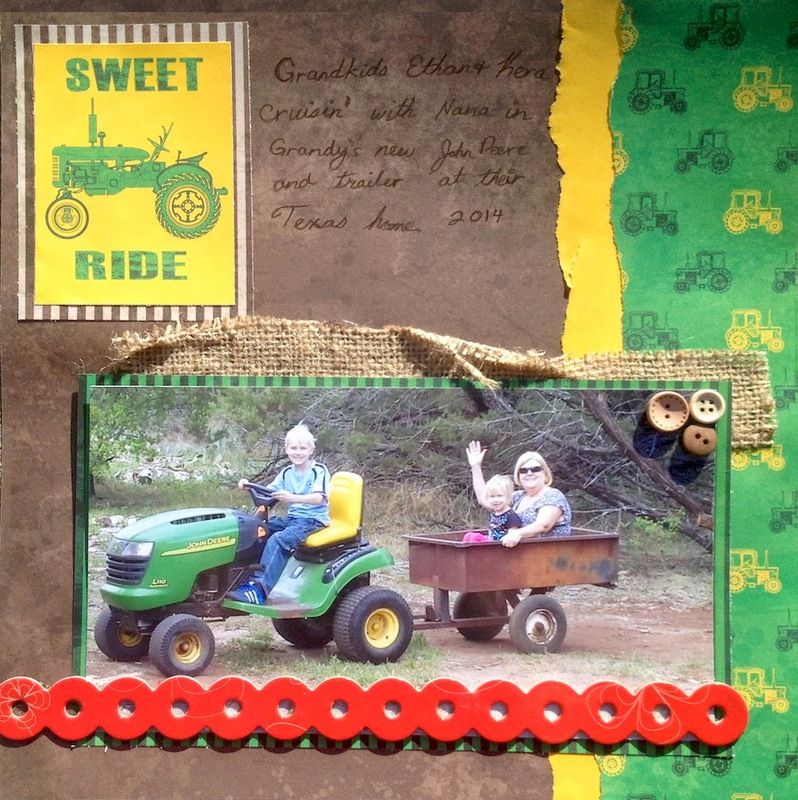 I die cut and embossed an arrow to direct attention from the tractor photo to the tractor card! I love this picture of my son. I can not count the number of times I have seen this exact expression on his face! Plenty of room for journaling on this card. 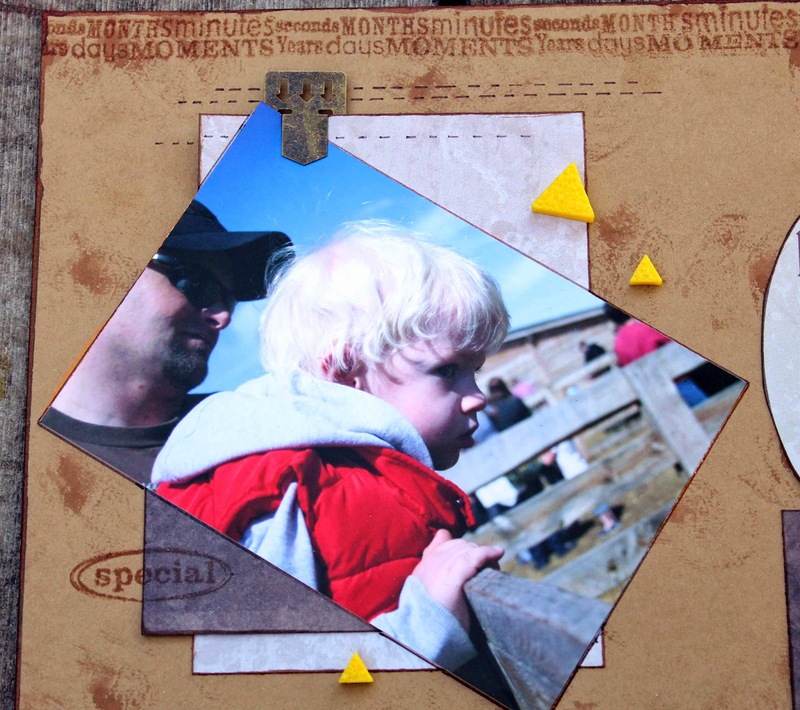 Pocket page scrapbooking is fast and easy, but there are still ways to creatively personalize the elements. I hope this has inspired you! Welcome Moxxie Fans! Susie hosting the blog today with another Down on the Farm Layout. This collection is so cute! The Mooove Over paper, with the cows all across the bottom, provides a perfect starting point for this quick and easy layout. I layered a photo collage over a block of the striped side of Fields of Gold. Creating the title block was simple! I die cut a fancy shape out of brown cardstock, then adhered the striped green frame from the sticker sheet on top of cream paper. I wrapped some twine around them both before adding the title with some rustic style alphas. The brown cow sticker was popped up - gotta love dimension - before I added the wood veneer chip from my stash! I cut tags out of coordinating paper and tucked them behind the photo collage. Good Morning Moxxie Fans! Susie hosting the blog today with a layout using the fabulous and new Down on the Farm collection! My sister-in-law bought a smoker a few years back and we have been feasting ever since! These papers are perfect for scrapping picnics, barbecues, and pot lucks! I built a simple background with really cute patterned paper then added a collage of pictures. I die cut a fancy shaped label then layered the "Some Pig" sticker on top! I swagged a burplap ribbon across one side of the layout and trimmed out this cute little pig from the Farm Journal Cards paper! 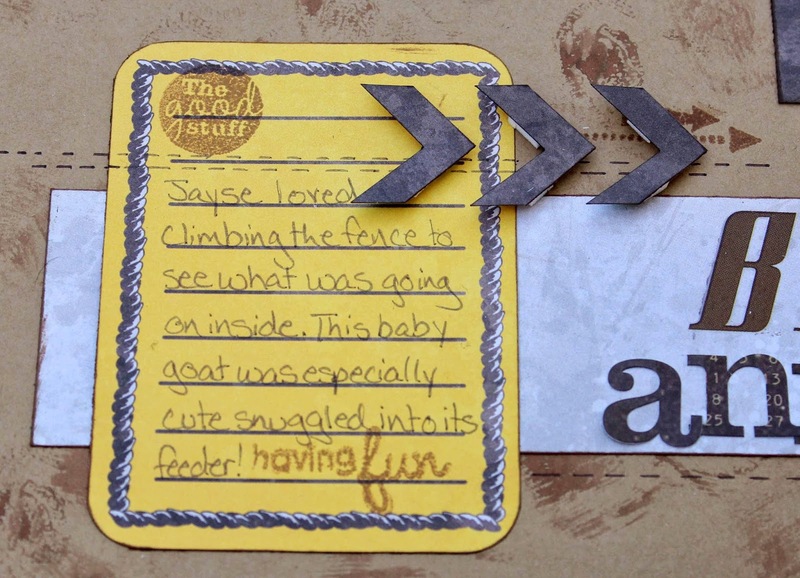 I added a few more details from my stash, die cut an arrow and tucked a tag for journaling behind a photo. Voila! Hi Moxxie fans! Dana Tatar here today sharing a layout that I created with the NEW Down on the Farm Collection. 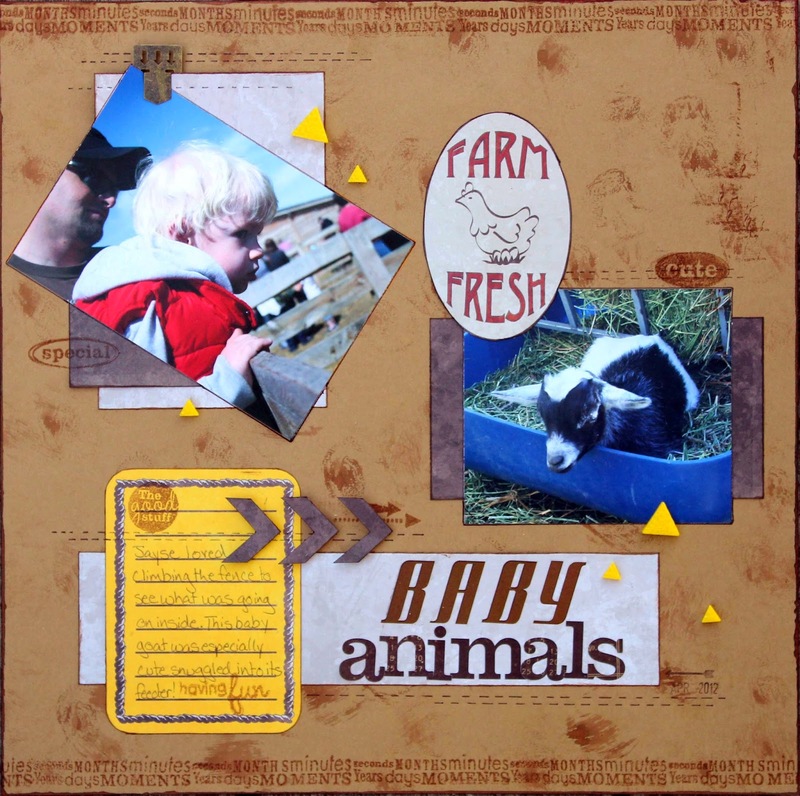 I had a lot of fun embellishing these papers for my fun feminine farm page. I fussy cut the Farm Journal Cards patterned paper to create die-cut accents for this layout. I added glitter to the sun rays and some fun brads to the tractor tires for a touch of sparkle. I fussy cut some straw to help fill in my flower clusters and embellished a die-cut with liquid pearls for a more feminine finish.